For the miller FF 500/BL. But also for older versions of the Mill/drill head PF 400 (from production no. 401-10910) and of the miller FF 500 (from production no. 5648). High concentricity and repeat accuracy. 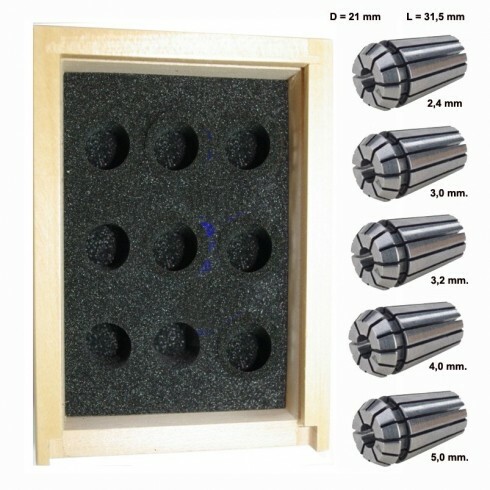 May be reduced to 0.5mm below their nominal diameter (intermediate sizes not required). D = 21mm, L = 31.5mm. 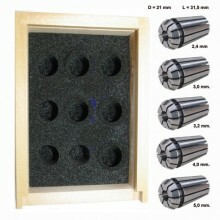 One each of 2.5 - 3 - 3.5 - 4 and 5mm are included. Supplied in a wooden box with sliding lid. Click the button below to add the Proxxon Multiple range standard type ER 20 collets to your wish list.